If you love The Great Gatsby, then this party is for YOU! It was a feast for the eyes and the lady of honor at this event sure knows how to throw a party! 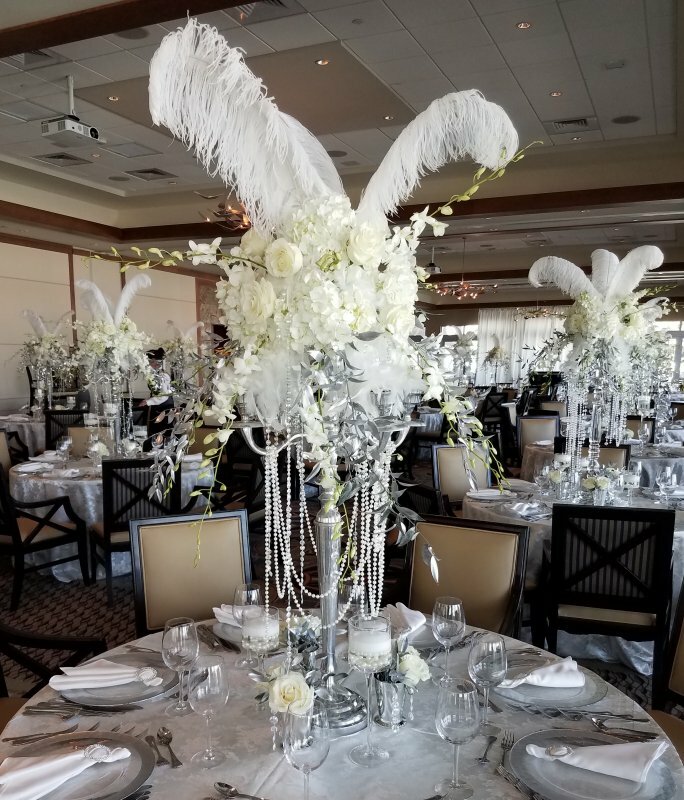 She loves themed-events and went all out for this Great Gatsby birthday party at the Sarasota Yacht Club. Guests entered to see a huge silver candelabra with orchids and lots of ostrich plumes on a huge round entry table. It was a stunning way to greet your guests, but that is not all they saw! Behind it was an ice carving of an antique car and nested inside was a huge bed of shrimp! The place card table had a lush and low arrangement of roses, trailing orchids, and hydrangea which created a very dramatic touch, perfect for a Gatsby party! 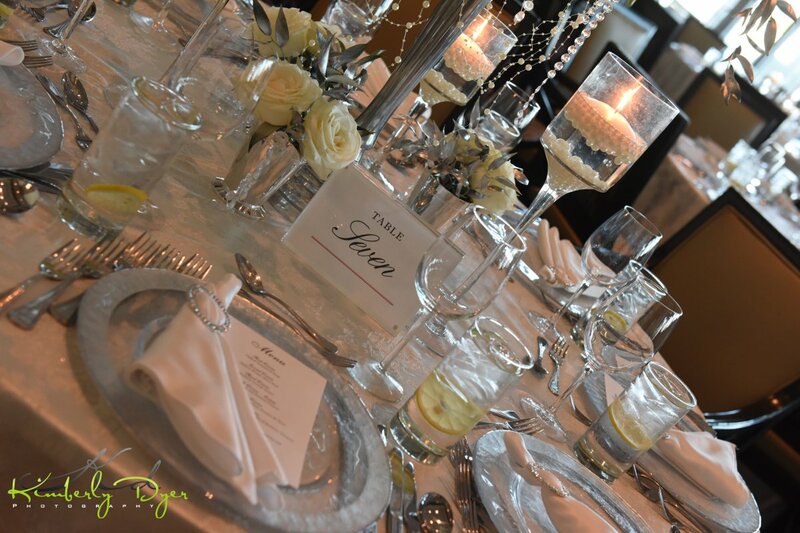 And twenty one guest tables were decked out in a glorious Great Gatsby way! 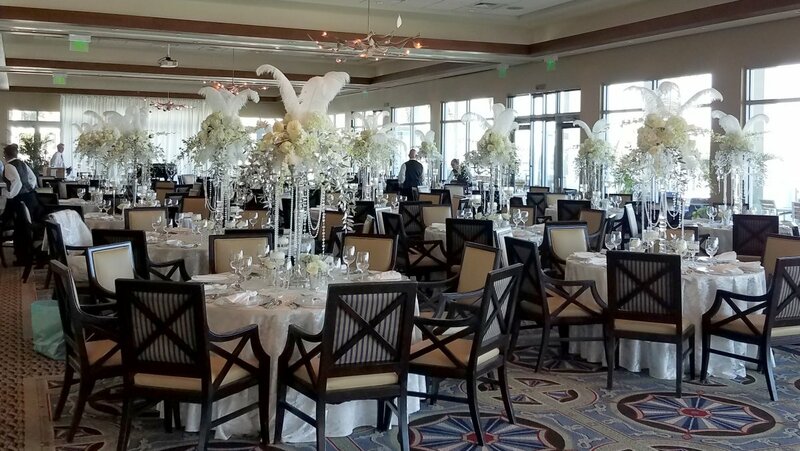 For half the tables, we used dramatic 44 ” crystal candelabras, the other half 48” silver candelabras—these created an enormous visual impact which is what we were looking for! 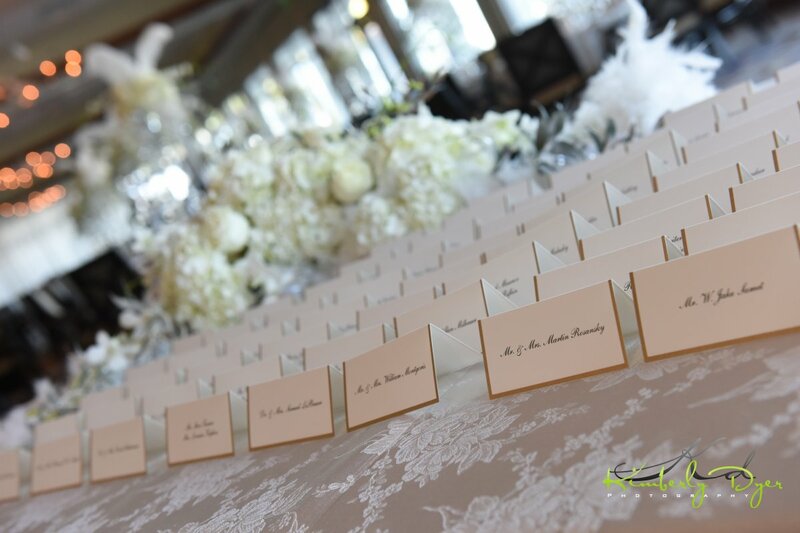 Between the arches of the candelabras, we placed white hydrangeas, roses, and many sprays of long white dendrobium! 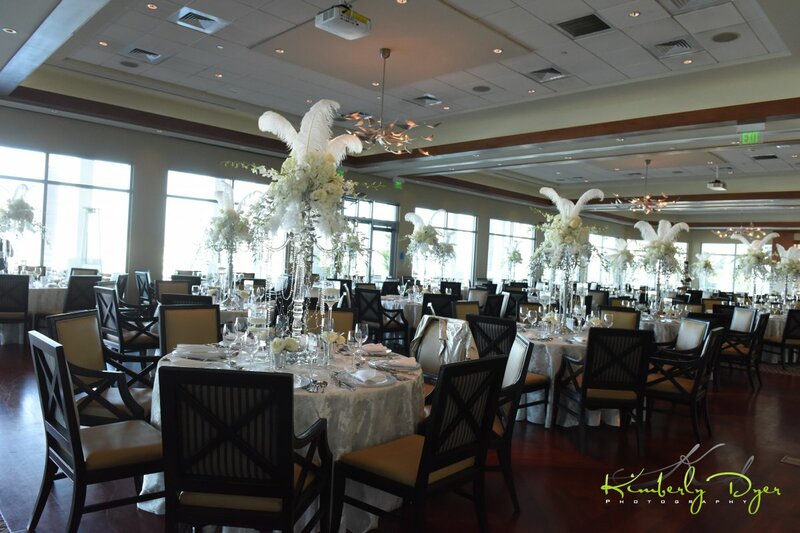 And to finish it off, three 30″ white ostrich plumes came out of the top…simply incredibly and totally Gatsby! Additionally, runners of crystals and pearls looped off the arms of the candelabras to trail onto the tables and nested right into 3 silver julep cups of roses along with silver ruscus nested between 3 varying heights of tall footed glass candle holders with floating candles. More drama, more Gatsby, more fun! And finally, the pièce de résistance was the cake by Cakes by Ron—it was truly a work of art! 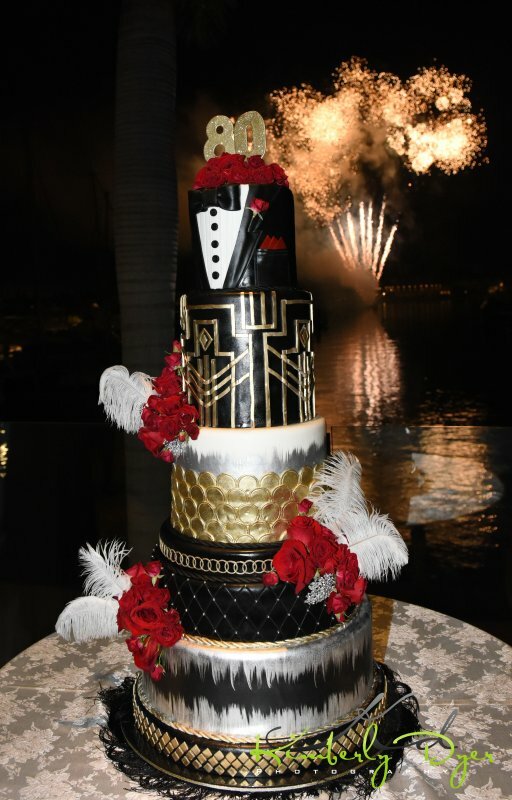 The tuxedo cake was trimmed with red roses and gold, the only color used for the event! At the end of the evening, the gorgeous cake was taken outside where they had fireworks as well…WOW! 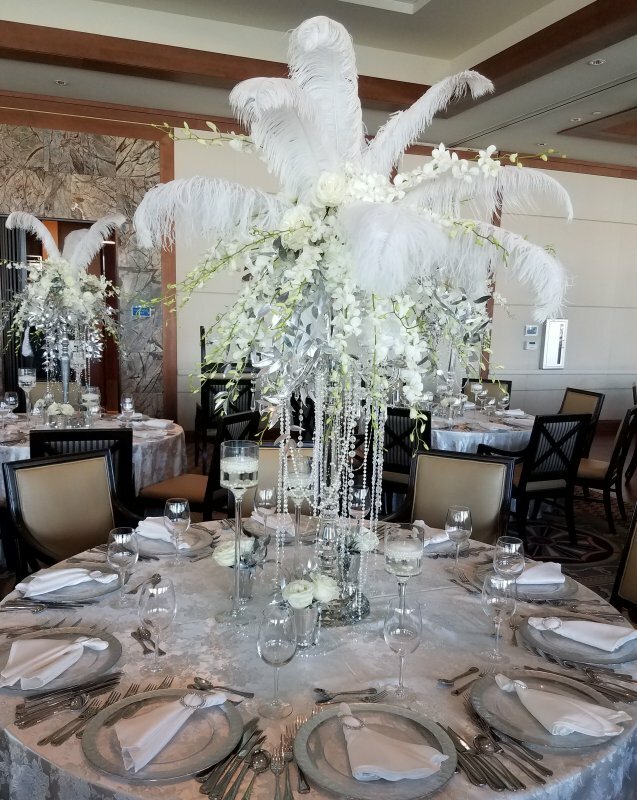 We were thrilled the Flowers by Fudgie team pulled off another spectacular event at the Sarasota Yacht Club! We love working with Karen Roman, who heads up special events, and Anthony Puccio, the amazing chef…they both do an outstanding job. If you are interested in working with us to create your dream birthday party, dream wedding, or dream event of any kind, contact us right away. It would be our honor to work with you!